A revolutionary marketing strategy proven to drive sales and growth. They Ask You Answer is a straightforward guide to fixing your current marketing strategy. Regardless of your budget, you are almost certainly overspending on television, radio, and print ads, yet neglecting the number-one resource you have at your disposal: the Internet. Content marketing is no longer about keyword-stuffing and link-building; in fact, using those tactics today gets your page shuffled to the bottom of the heap. Quality content is the key to success, and you already have the ingredients in-house. This book shows you how to structure an effective content strategy using the same proven principles that have revolutionized marketing for all types of businesses, across industries. Author Marcus Sheridan's pool company struggled after the housing collapse; today, they're one of the largest pool installers in the U.S., turning away millions of dollars in business they simply cannot accommodate every year. How did he manage it? He answered questions. This book shows you how Marcus's strategy can work for your business, and how to use your keyboard to bring customers through the door. • Boost your company's web presence with methods that work. • Build a level of trust that generates customer evangelism. • Leverage your in-house resources to produce winning content. • Utilize tactics that work, regardless of industry or sector. When people have questions, they ask a search engine. If you have answers, the right content strategy will get them to the top of the search results and seen by millions of eyes every day. Drop the marketing-speak, stop "selling," and start answering. Be seen as an authority, not just another advertisement. They Ask You Answer describes a fresh approach to marketing and the beginning of big things for your business. 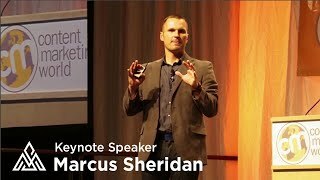 Marcus Sheridan is a highly sought-after international keynote speaker known for his unique ability to excite, engage and motivate live audiences with his simple, yet powerful transformational business approach. Marcus has been dubbed a "Web Marketing Guru" by the New York Times and in 2017 Forbes named Marcus one of 20 "Speakers You Don't Want to Miss." Not one to be limited to the stage, Marcus is most often found walking through the crowd, calling audience members by name, and bringing them into his presentation. As author of the content marketing guidebook, "They Ask, You Answer," Marcus has not only inspired thousands to achieve their potential but has given them the tools they need to get there. Mashable rated his book the "#1 Marketing Book" to read in 2017. Forbes listed it as one of "11 Marketing Books Every CMO Should Read." Marcus has been featured in the New York Times, Inc., The Globe and Mail, Content Marketing Institute, Social Media Examiner, and more. Marcus has spoken to companies such as Discover Card, Microsoft, eBay, McKesson, Cision, Whirlpool, Moe's, Genpact, Love Funding Group and more. He has inspired thousands of audiences and helped millions of people from all over the world to achieve their own success with his "They Ask, You Answer" philosophy. But Marcus' story didn't begin on the stage. It started with a business being created and run out of the back of a beat-up pickup truck. Marcus's experience of saving his swimming pool company, River Pools and Spas, from the economic collapse of 2008 has been featured in multiple books, publications and university case studies around the world. From its humble beginnings as a three-man company, to one of the largest manufacturers and installers in the country, River Pool and Spas has the most visited pool website in the world, with over 750,000 hits a month. Marcus' experience as an entrepreneur and business owner, who had successfully saved his company, led him to opportunities to share his story and help others. What started as speaking from the stage quickly turned into a Sales and Marketing consulting agency, The Sales Lion. Using his marketing principles, Marcus and his team led clients step-by-step through the process of growing and even transforming their companies. In early 2018, The Sales Lion merged with IMPACT, establishing one of the most successful digital sales and marketing agencies in the country. Within his speaking company, Marcus Sheridan International, Inc., Marcus gives over 70 global keynotes annually where he inspires audiences in the areas of sales, marketing, leadership, and communication. More than any other time in the last 100 years, the buyer of today has made a dramatic shift in the way they make purchasing decisions. Unfortunately, many companies haven't adapted to this shift and are not prepared for the continual evolution of this "digital consumer." In this talk, Marcus Sheridan brings clarity to the way buyers have changed and exactly what companies must do to, not only align themselves with this shift in buyer patterns but take advantage of the digital age as well. If you like to be engaged, challenged, and moved, you'll love this keynote with Marcus Sheridan! • Find out how video and visual learning is impacting the buying process and what organizations must do to be seen as a "media" company. Studies have shown that by the year 2019, 80% of all content consumed online will be video-based content. With such a dramatic trend, what is your business and organization doing to not only meet the demands of today's buyer, but to also stay ahead of the marketplace and be prepared for what is next? 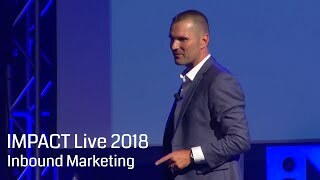 In this action-packed keynote, Marcus Sheridan will show powerful stories of how B2B and B2C companies are using video to not only build their brand, but significantly drive sales and marketing revenue in the process. Sheridan will also discuss exactly how any organization, regardless of size, can develop its own culture of video and experience incredible results. • See what type of video content does and does not move the needle in terms of sales and revenue. • Discover how to integrate video into the sales process to improve closing rates while decreasing sales cycles. • Learn how to set up an in-house "media company" and engage your team in the process. Does your organization have a story? And if so, does your team understand how to tell it well? The reality is, although everyone seems to be talking about the power of story these days, few organizations have a true culture of storytelling, one that trickles down to every element of their team, their brand, and their company's mission. In this moving keynote, Marcus Sheridan will help you discover the steps necessary to truly making "story" a core element of your brand, as well as the impact it can have on the business, brand and bottom line moving forward. The digital buyer of today has changed business as we know it. With such rapid change, many organizations are being left behind. In this powerful keynote, Marcus Sheridan will show seven proven steps to turning a traditional organization into a true media powerhouse. Using examples in the B2B and B2C space, you will see how real companies, just like yours, are not just embracing the digital age, but dominating their industry because of it – ultimately building their brand, business, and bottom line in the process. • Learn a step-by-step method of creating a digital culture that involves all departments and gets results. For years, businesses and brands have been able to get by with a massive silo effect existing between sales and marketing departments. But today, times have changed, and because marketing teams have such a significant impact on the buying process, companies must do whatever it takes to eliminate these silos and leverage both departments to engage today's digital consumer and get the results they're looking for. 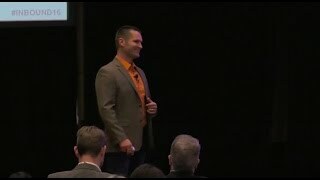 In this talk, Marcus Sheridan shows exactly how other companies, in diverse industries, have managed to eliminate these silos, ultimately having a major impact on the company brand, business, and bottom line. With the information age in full swing, brands can no longer expect traditional methods to win customer interest and loyalty. One of the essential keys to gaining the trust of today's digital consumer is by becoming their go-to source for helpful information. The businesses and brands that can do this better than anyone in their space can, literally, become the Wikipedia of their industry and ultimately gain the consumer's trust AND an incredible amount of market-share in the process. • Discover just how much buying habits have changed and why "name recognition" is no longer enough, learn the types of transparent and honest content that move consumers to not only notice a brand but to switch to new ones as well, and find out exactly what must be done to become the "voice of trust" in your space.